This article is part of Morningstar's "Perspectives" series, written by third-party contributors. Here, Chris Hiorns, manager of the Amity European fund at EdenTree Investment Management, looks at opportunities in Europe. The recent shift in European investors’ attitude from optimism to pessimism has been rapid, but it is now creating some compelling entry points for long-term investors. A number of factors have weighed on the region in recent months. Major European manufacturing and construction Purchasing Manager Index data disappointed, which in turn led to a lower economic growth outlook. Neither did Europe escape the sell-off which has unsettled global equities markets since the end of September. Despite these macro headwinds, the European economy actually remains in a much better place than it has been for much of the last decade. Weakness in the automotive sector, resulting from new diesel emission regulations, should only be temporary. Moreover, the US economy remains buoyant and the Chinese authorities are acting to deal with the slowdown in their automotive and property sectors, and they have a long record in managing to maintain consistently high growth. At a more fundamental level, the signs are there that the tide is finally turning and the European market is shifting in favour of value investors. Eight years of outperformance by growth stocks has led to a de-rating in value stocks, even as growth stocks themselves have been re-rated. The result has been a deep divergence between the two. Growth stocks rolled over in the equity market sell-off since the end of September, against a backdrop of decelerating corporate earnings and softening economic growth. Tech and consumer discretionary stocks all underwent heavy selling. However, the tech sell-off, particularly in semiconductors, was justified given they were trading on high multiples and top-of-the-cycle earnings. But for value investors, the bear market conditions may finally have begun to lead a revival in sectors such as telecoms and utilities, which recently have outperformed growth areas. We have been adding to our European telecom exposure, most recently through the purchase of Telefonica, which should benefit from improving economic conditions in Latin America, including more business-friendly policies being advocated by the new Brazilian government. Moreover, the wider case for being positive on the telecommunications sector in Europe has increased recently, following the approval of the T-Mobile/ Tele2 deal in the Netherlands. The merger was approved by the EU regulator without any amendments. This should have a positive impact on industry consolidation in other European markets such as France. We continue to be overweight to the telecommunications sector, with positions in Orange (ORA), Telefonica (TEF), KPN (KPN) and DTE (DTE). It hasn’t all been positive for value – industrials and consumer discretionary sectors have sold off. But this was too indiscriminate – pricing in a severe economic slowdown on many value companies which were already trading on low multiples. 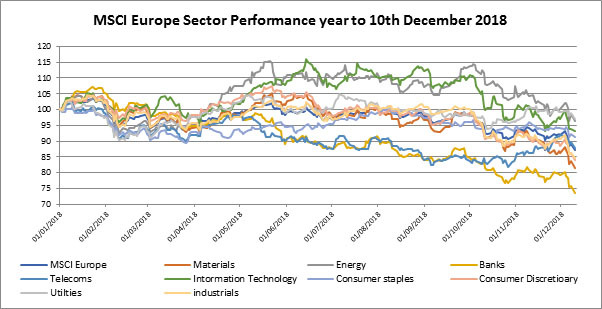 Moving into 2019, we are positive on cyclical stocks trading on low valuations across a fairly broad range of sectors; from tyre manufacturer Michelin (ML), building materials company Saint-Gobain (SGO), recruitment specialist Randstad (RAND), global packaging company Smurfit Kappa (SKG), and Imerys (IY4), the industrial minerals company. We believe these firms not only offer compelling value opportunities but also have sustainable business models that make a positive contribution to wider society and the environment. All of these firms are trading on price-earnings ratios of 10 or below, and offer strong stable dividend yields of 4% or more covered by strong cash flows. While we believe defensive areas like healthcare may lag, we are positive on the financial services sector, which sold off heavily despite an improved regulatory outlook and stronger capital position. In 2019, it should benefit from a strengthening in the European economy and a rebound in investor confidence, which has fallen to low levels off the back of geo-political instability. We currently hold the global banking institution Banco Santander (SAN), and Dutch-based financial group ING (INGA), both of which are trading at forward PEs of 8.2 and 7.5 respectively and have forecasted dividend yields of 5.6 and 6.8%.